COLUMNA MESSIANIC RESEARCH CENTER: Climate Change Untold Truth 19: GOD DESTROYS THOSE WHO DESTROY THE EARTH (Rev 11:18)! Without God's Infinite Science of His Kabbalistic True Religion, Man's Science and Technologies Are Finite, And is Now Reaching Its Limit/Breaking Point! Climate Change Untold Truth 19: GOD DESTROYS THOSE WHO DESTROY THE EARTH (Rev 11:18)! Without God's Infinite Science of His Kabbalistic True Religion, Man's Science and Technologies Are Finite, And is Now Reaching Its Limit/Breaking Point! The LORD God is infinite, and His Messianic Kabbalah Wisdom or Science of the Bible is also infinite. Thus, Man's Science & Technology that are disconnected from the infinite Science or Wisdom of the Bible is considered finite. Everything that is finite has its limit. When a finite thing reached its limit, it is in its breaking point. If it exceeds its limit, then it will self-destruct, and it will damage its surroundings. As National Geographic Channel said, "Man is capable of making extreme engineering, but eventually it breaks down." Thus, Technology without God's Spirituality and Morality is a very dangerous human endeavor. This is guaranteed to result in grievous Global destruction and death, as we experienced and observed today! 1. The Global Climate Change that is getting worse every day, affecting and will affect millions and billions of people worldwide. For more information, go to this link: WHAT IS THE BIBLICAL TRUTH OF CLIMATE CHANGE & GLOBAL WARMING? We Heard A Lot About Climate Change From Men. And It Is Getting Worse. It's Time to Listen to GOD and Know What He Says About Climate Change! 2. The oil rig explosion and massive oil spill that fouled the waters of the Gulf of Mexico and wrecked havoc on humans and wildlife near the coast and on shore. See the article: The GULF OF MEXICO OIL SPILL DISASTER: A Classic Example of the 2nd Law of Theodoxazo. 3. The Fukushima Nuclear Meltdown in Japan caused by the Tsunami, that was caused by the 9.0 magnitude Earthquake. The resultant radioactive wastes are now spreading in the world's oceans and seas. 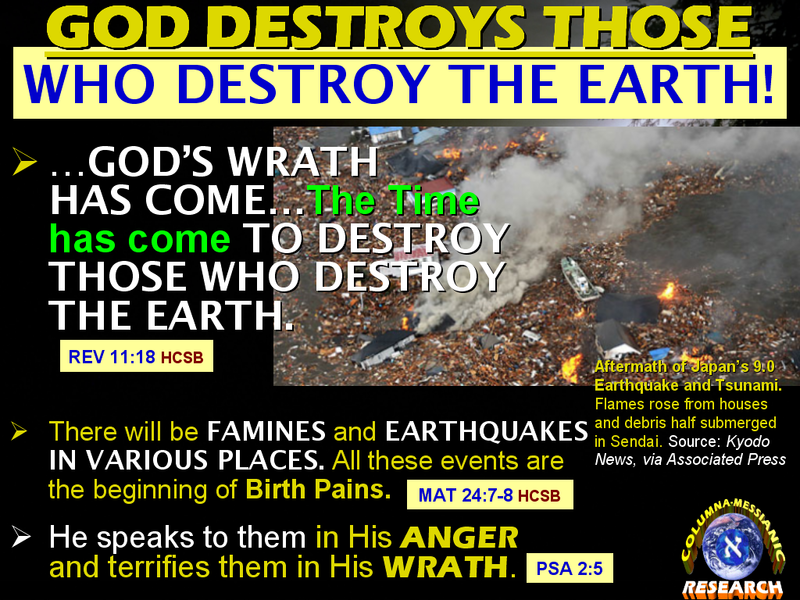 GOD DESTROYS THOSE WHO DESTROY THE EARTH! Technology without God's Spirituality and Morality is a very dangerous human endeavor. This is guaranteed to result in grievous destruction and death, as we experienced and observed today! Japan is an advanced and high-tech country; yet all those advanced high-technology, machinery, and electronic gadgets are all impure and filthy in God's eyes. And they all pollute and destroy God's beautiful Earth. Therefore, God decided to destroy them using Earthquake and the resultant tsunami wiping out their high-tech gods, gadgets, and idolatrous goods! Therefore, what happened to Japan, and to any proud nation on this Earth, is just a result of God's process of "sweeping" out or cleansing His Earth. So, we see in the pictures those high-tech cars, boats, ships, houses, buildings, bridges, and many electronic gadgets, including people and animals, as trash and garbage being swept away by the Tsunami that resulted from the 9.0 earthquake. What happened to Japan, God will do the same to the other countries that also make themselves filthy and unholy. God is not a respecter of nations, especially that of the Gentile nations. WITHOUT GOD'S SCIENCE, THE DIRECTION OF MAN'S ADVANCED TECHNOLOGY IS TOWARD DESTRUCTION AND DEATH! Thus, man's education, religion, marriage & family, sports & entertainment, politics, leadership & governance, business management, and his treatment of his neighbor; all became impure and unpleasant in God's eyes. They all need the purification process (destruction of the physical and spiritual filth) of Climate Change disasters, strong Earthquakes, towering tsunamis, volcanic eruptions, etc! CLIMATE CHANGE: THE ULTIMATE PROOF OF MAN'S SCIENCE AND TECHNOLOGIES REACHING AND EXCEEDING ITS LIMIT! The ultimate example of Man's Science and Technology reaching its limit, and even exceeding it, is the deadly CLIMATE CHANGE that is now wreaking havoc and destruction to Man and other living creatures on Planet Earth. All these extreme problems demand solutions that go beyond and above Man's Science & Technologies. This is where the TORAH (Bible) or Messianic Kabbalah Science & Technologies are urgently needed. 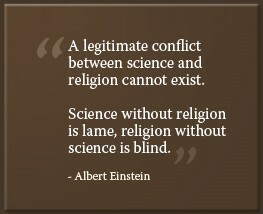 This needed convergence of the BIBLE'S MESSIANIC KABBALAH Science and Man's materialistic Science will result in the refined Universal Science and Technologies that are the ONLY means to truly eliminate or mitigate the perils and evils of CLIMATE CHANGE, and of the other human problems. This Torah-refined Science and Technologies will tame Nature; and they will educate the people of the World about the proper use of their lives and the resources of Planet Earth. The resulting transformation of people should elevate their thinking and standard of living, eliminating or alleviating Climate Change crisis, Energy crisis, Economic crisis, and other world crises. Continued on Part 20 > NOW, NASA AND MANY CLIMATE CHANGE SCIENTISTS ARE ECHOING THE TERRIBLE WARNING PROPHECIES OF GOD! What Should You Do To Escape From This Terrible Judgment of GOD? Return To The LORD, And Know Him! Or proceed to: CHOOSE TO GO AND ENTER THE KINGDOM OF HEAVEN. NOT BECAUSE IT IS EASY, BUT BECAUSE IT IS HARD (In the Human Level)! But With The Lord God Nothing is Too Hard! Leny Padilla Abibico and 4 others like this. Dacumos Leonardo Who is this Lope Columna Brother? A man called by God? Is He a Christian? Lope Columna For the answer to your questions, Mr. Leonardo, go to: Q155 of The BIBLE EXPLAINER. Vincent Cass-Labs How could Jeremiah 9:12, Isaiah 46:11 be interpreted LOPE COLUMNA as The Man Called By God To Explain and Execute His Counsel??? Vincent Cass-Labs To claim someone is "Called By God To Explain and Execute His Counsel" should be put to the test in the light of scripture. It seems to me, LOPE COLUMNA is just like a Felix Mnalo of the INC claiming to be the chosen one by God to stablish his church or the Helen White of the Mormon.. Kits Jaspe Forcrey Please have time to direct your comment to Iglesia Ni Cristo rather than keeping them all by yourself. Vincent Cass-Labs Kits Jaspe Forcrey It is not my problem if i perceived that Filex Manalo establish the INC in 1914 when he officially registered it, as the INC members always claim. The Muslim claims that Muhammed is the last messenger, you claim that Filex Manalo is "Last Messenger.of God", now the burden is in you to prove your claim..
post. I'll bee coming back to youг web site foor mоre soon. keep սp postting tɦese types of articles.